January - the month of resolutions, diets, and everything health related. So what about if you're already on that journey? Well, you kick it up a notch! My last "success" post looked back at the first year of this journey. It's still crazy to think how far I have come in a year. In a way, I almost don't remember that girl that started out. Don't get me wrong, I still remember every feeling of those first few months and have even seen myself in some of the new girls in my classes. I smile and introduce myself because at that point, the hardest part is truly just walking in the front door and seeing a smiling face makes all the difference. But when I look in the mirror after taking a shower, I don't immediately look away in disgust, but keep staring because I'm actually starting to like what I see in the mirror. I don't wallow in self pity if I gain a pound or two, because I've learned my body is strange and it'll come back off. I've learned to give myself grace because by God I've earned it. And that, my friends, is worth more than anything else you'll read on this post. But alas, let's get to the other good stuff - numbers! December was a rough month in the world of healthy Sarah. Parties, Christmas, New Years = all the really good food that you shouldn't eat but do. I gained a few pounds back so I finished my year long journey at 15.2 lbs. So January 2 Aaron and I started round two of the Whole 30. You can read about what our modifications were for the Whole 30 here. To make a long story short, we totally failed at Whole 30. But it turned out to be a good failure because we learned that we could keep up a mostly Paleo lifestyle with a few "cheat" days here and there. We learned to make better choices when we did cheat, like Subway instead of Cookout, and learned that a few indulgences once in a while helps keep the sanity (like Halo Top icecream, hello happiness!). We're both super happy with how the whole month turned out. Aaron's even lost some weight! He's back in his skinnier jeans and he's out of loops on his belt, ha. It was a good start to 2017. This month has also been a weird month for me in that I've seen a lot of doctors, including a cardiologist! Turns out I have a heart murmur that I've apparently always had, but has just now been found. You're probably thinking why I'm telling you this. I say that to say that I have now seen my heart, how my heart valves work and have learned that I have a nice, super strong heart. So go me! My resting heart rate has been down in the 58-62 range for most of the month, which I'm pretty happy about. This is one I'm pretty friggin excited about! I've said multiple times that I am not a runner. And I'm still not, but I can now run. One night last week, after my spin class, I went directly in to my TRX circuit class and, thanks to endorphins, did some awesome running for our warm-up. Not going to lie, it's always a race in my mind when we run laps, whether it really is or not! So I started wondering what my running endurance would be now. Back in October, I posted that I was able to run 2.4 miles. On Sunday, I made Aaron go run with me at the high school near our house because I wanted to know what I could do. 3.3 miles. I ran 3.3 freakin miles! If my legs weren't like jelly, I seriously would have done some jumping and whooping. This from the girl that used to swear she would die after a mile. We're now getting to that point in weight loss that is awesome and yet also annoying. Half my clothes don't fit. My workout pants are too big, my tops are huge and now the tops are hitting like halfway down my chest. Sorry to the people in front of me in spin that get to look at my cleavage the whole time. Don't get me wrong, it's mostly awesome because I'm fitting back into clothes I haven't seen in years! Even my small 12s are now fitting. So if you're in the market for some used XL and size 14 workout clothes, let me know! I got ya covered! Today's photos are comparing last month and this month. There's not much difference, but that's okay. It's only a month! End of last month and Monday night. Yay new tops that fit! My favorite thing about any time we do the Whole 30 diet is the jump start it gives my weight loss. Even with completely failing and modifying the diet, I still had some major changes in my measurements. Waist - This one. This month alone I've lost 2" off my waist. Since September, I've lost 3.75". Sometimes I want to kick myself for not doing measurements in the beginning because I bet that would be kind of insane. Hips - I lost 0.5" off my hips. I've lost 2" total off my hips. Thighs - I actually gained some during the middle of the month and then it went back down. Let's just get to it - I lost 7.6 pounds this month! Whoop! I know it's not all about weight, but man it feels good to see that number go down! This means I'm officially at 22.8 pounds lost since January 2016. But let's also talk weight for a minute. The last time I fit into the clothes I'm in right now, I was a good 20 lbs less than I currently weigh. 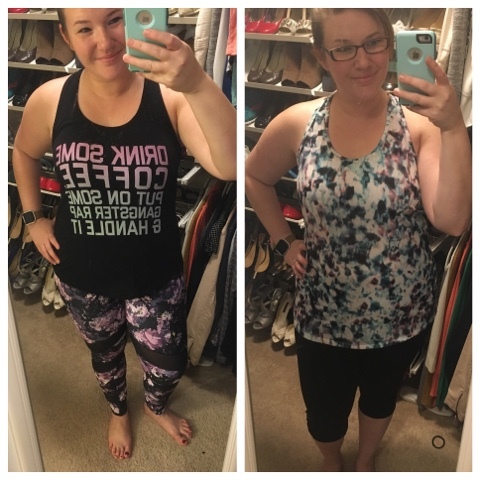 My friend Chrissy talked about why she doesn't weigh herself in one of her blog posts, My Health Journey: Progress Report. She talks about how at one point she felt "thin," but she wasn't healthy. She started focusing more on eating good food, not just being low carb, and running and doing yoga. She gained weight, but she lost two dress sizes. It's important to not always be so focused on your weight and to focus on other successes, especially being healthy. At my current weight, I do still need to focus on losing weight because I'm definitely heavier than is healthy. I'm moving in the right direction and I'm healthier, and happier, than I have been in a long time. But I have a long ways to go. Your weight matters, but it can't be all that matters. The last time I was this size, I worked out twice a week and could run a mile. Now, I work out 5 days a week, do about 6 -7 classes a week, and can run over 3 miles. There is a lot more muscle to me than there used to be, probably about twenty pounds more of it. So weigh yourself, but don't lose your mind over it. So we started 2017 with a bang. I'm within 3 pounds (!!) of my next big goal - 25 pounds down. I thought about it long and hard as to what my goal gift will be. It can't be food. I'm learning to have a new relationship with food, so I can't reward myself with a plate of cow from Ruth's Chris. I've decided that my reward to myself at 25 lbs down will be a new shirt from Burn, my gym. They have super cute tops and I have yet to indulge. How'd your first month in 2017 go? Do you have any new goals you're setting or getting close to? !